Act III begins with you still 'alive'. You're in the CEMETERY next to your own grave. Gaspard the Wonderdog tells you that you've become a werewolf. He'll also teach you all about the scents and how to change into your werewolf form. 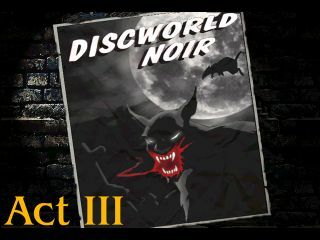 To change into a werewolf single-click on Lewton and select the werewolf image. To revert back to your human form click the Lewton image. Also note that certain scents can be collected (by double-clicking on them) and kept in a separate inventory, that is accessed by clicking the wolf head (while in werewolf mode). To compare one scent with another one, hold its icon over the second one (in your inventory) and double-click. Remember that your actions as a werewolf will be in brown text. Change into a werewolf and follow the trail of magenta with glowing dots. To follow the scent double-click on it. You see the chalk outline of where you were killed. Next to the chalk outline you find some moss. Perhaps you could get more information on the moss from someone who's a student of flora! Change back into werewolf mode and analyze the magenta with flashing dots (right-click) to realize that it's the murderer's trail. Then follow the scent again. The trail leads back to the CEMETERY, below a stained glass window that you recognize from when you were in the TEMPLE OF SMALL GODS. You'll see a silhouette of Mooncalf through the window. Ask to speak to the Count. His health is fading and 'Death' is with him. The Count previously told you that he's a student of flora, so show him the moss. He tells you about books on plants in the Libraris Apocrypha. The Libraris Apocrypha is accessed by talking to the Butler. To find a book on a particular subject hold and double-click either an inventory object or a Note-book Entry over the index cards. Use the moss to find the book 'On the Nature of Plants'. You learn that the moss grows in the SEWERS. Next use The Sewers entry on the index cards to find some ancient plans of Ankh. A new location in the SEWERS will be activated. Ask to see Carlotta and the Butler checks if she's at home. When he's away change into werewolf mode. From her scent you know that Carlotta is a werewolf! Ask the butler to tell her to meet you at the CAFE ANKH. Go through the large pipe into another part of the SEWERS. In werewolf mode you again find the magenta trail with flashing dots. Follow it into a passageway and note that it disappears into an area in the wall. Climb into the lair (in the area of the wall where the scent disappeared). Search through the debris and you find a pendant. Examine it (in your inventory) and note that it appears to be hollow inside, but you won't be able to open it yet. You'll need the help of somebody who knows about artefacts and/or is 'mechanically' minded. Talk to the Grim Squeaker to learn that whoever (or whatever) was in here came on the Milka. Also, if you show him the pendant he tells you that the 'thing' brought it with. Show the pendant to Leonard and Two Conkers. They tell you that it's an exact replica of the seal on the doors to the Temple of Anu-anu in Al Khali. Take note that they're still working on the flapping-wing-flying-device. Go to the trash heap and change into werewolf mode. Compare the serial killer scent (from your inventory) with the magenta traces to work out that the killer entered the Palace by concealing himself in a wine barrel. Again ask to go to the Library. You find a book on the Temple of Anu Anu, but somebody has torn out the page on door mechanisms. You know there are another two libraries at the Assassins' Guild and Unseen University (you remember Warb mentioning it), so maybe there's another copy of the book at one of those. Nobby rushes out, leaving the crowbar he was using on your desk. There's a 'bug' in the program at this point in the game. If you didn't take the replacement crowbar from the cart (in Act II) you won't find the one Nobby left on your desk. You must leave the office and then return immediately (or later) to find it. If you're going to investigate the Counterweight Killings then Death seems to be the logical person to start with. You ask him about the Counterweight Killings, Clerk's Murder, Wizard's Murder and Merchant's Murder but he won't tell you anything. However, you get the feeling (after discussing the Merchant's Murder) that he could be trapped into giving you information if you knew when or where the merchant was killed. Rhodan's no longer here, but you'll find some plaster-encrusted bandages in the alcove where Malachite was. You can get two very useful bits of information out of Nobby. When you show the bandages to him he tells you they're used by plaster surgeons in cosmetic surgery for trolls on the run who want to change their faces. Also, if you ask about the envelope he suggests it might be a blackmailer's envelope used as a bluff. Carlotta received your message and is waiting for you. When you tell her about Regin's Murder she again tells you she was at the TEMPLE OF SMALL GODS at the time. This triggers the 'Carlotta's Alibi' dialog, and when you talk to her about it she claims to be a follower of Errata and you enter this in your Note-book. She similarly claims she was at a service when you discuss Malachite's Murder. Samael, the Pianist, is quite helpful about the Counterweight Killings. Ask him about the Clerk's Murder to find out the clerk was in charge of ordering the wines and someone is coming to collect the next shipment. When you discuss the Wizard's Murder he talks about Ksandra, who used to work at the University. If you could get her job it would certainly be a way into the University to access their library! Use the crowbar to open one of the wine barrels earmarked for delivery to the Palace, and climb inside it. Continue along the passage until you find the double doors. You'll hear a conversation on the other side, but it's 'humanly' impossible to make out what's being said. Turn into a wolf and with your improved hearing you'll hear Vimes and Lord Vetinari talking on the other side of the double doors (double-click on them). You learn that the murdered clerk's name was Saipha, and that he was drowned in a wine vat. You may want to also listen at the door opposite the double doors. The two clerks are discussing you! You'll end up back in your office. Remora Selachii, the assassin, pays a visit and tells you Lord Vetinari hired him to assassinate the intruder at the Palace. You get some useful information and a few hints by talking to Mankin. Ask him about the Wizard's Murder to find out he heard about it from Mrs. Fomes, the Head Chambermaid at the NEW HALL. He mentions the library and you discuss working at the University. Was Mrs. Fomes here to advertise for a replacement for Ksandra? Remember Samael told you she quit her job! Ask Mankin about the Merchant's Murder and he tells you it was someone from the MERCHANT'S GUILD. A new location at the MERCHANT'S GUILD will be activated. Read the Notice Board to see the advert for a 'Bedmaker and Laundryman' wanted to work at the University. This activates the NEW HALL location. While you're here, check out Sapphire's Dressing Room. In werewolf form you'll notice a bright cyan blob. You can take this scent and store it in your Inventory, but it's not really necessary. Revert back to human form and take the bottle of perfume that you find where the scent was. You'll be met at the door by Mrs. Fomes. To accept the job select the Bedmaker and Laundryman entry in the Note-book. Ask Mrs. Fomes about the Wizard's Murder and she'll tell you about Dead Men's Pointy Boots. Through the door in the dormitory you'll find the Porter. When you ask him about the Wizard's Murder he tells you the victim's name was Mathom, and that he was poisoned. Ask him about Dead Men's Pointy Boots and he explains that it refers to the upper levels of magic, where positions are scarce, and wizards only advance on the death of their superiors, thus filling their 'empty pointy boots'. He won't let you into the library, but does talk about the students getting their course books from it. You also note that students are required to read a chapter on each subject. This student has the books required for all the current subjects. Perhaps he'll fetch the book you need from the library if he thinks it's required for a subject. By using the Temple of Anu Anu entry on the octarineboard, you change 'Great Nef' to 'Al Khali'. You leave, intending to return later to see if the student has obliged. The Gatekeeper tells you there are 'only so many good positions to go around' (shades of Dead Men's Pointy Boots). He won't tell you anything about the Merchant's Murder, but if you mention Dead Men's Pointy Boots he lets slip that the victim's name was was Gamin. Maybe you can use this information to trick Death! When you ask Death about the Wizard's Murder (if you haven't asked him before, ask twice this time) he'll be tricked into telling you that Gamin was strangled. Check whether the diligent student has fetched the book from the library. Success! You find a copy of the book on temples (Frescoes and Fatal Traps of the Temple of Al Khali) in the sturdy unlocker. Hold and then click the pendant icon on the Book on Temples to open the pendant. Inside the pendant is a list containing eight names, some of which you recognize. Most notably that of Mooncalf because of his connection to Anu-anu. When you mention some of the names on the list to Mooncalf, it clearly unsettles him. Now all you have to do is watch what he does, and you know the perfect place to do that from! Go to the outside of the stained glass window behind Mooncalf. Change into a werewolf and this time you'll see two silhouettes, Mooncalf and a troll. Thanks to your wolf senses you'll overhear Mooncalf talk about a meeting of the 'True Believers' to be held after the sermon. You need to find out about Mooncalf's sermon. Maybe Malaclypse can help you. Ask him about the True Believers Meeting and he tells you about the Inner Sanctum, but tells you he can only go in there if he's got a follower with him. Talk to him about Errata to trigger 'The Inner Sanctum' dialog. Select this dialog topic and Malaclypse takes you there. Note that Malaclypse also talks about Mooncalf sneaking off to a secret sanctuary after each sermon. There's a lectern in the Inner Sanctum. First look at the lectern (right-click) to discover that it has a cavity in it's base, then climb into the cavity by double-clicking the lectern. During his sermon Mooncalf's feet will be visible. To make it easy to follow him afterwards, pour the perfume on his feet. If he leaves before you do it, or if you don't have the perfume, repeat your conversation with Malaclypse about 'The Inner Sanctum' to get there again. Thanks to the perfume's scent you can follow Mooncalf to the SANCTUARY in your wolf mode. You eavesdrop at the window and hear Mooncalf say he thinks you know about Nylonathatep. You didn't - but now you do! A new location at the SANCTUARY will be activated. Look for a book on Nylonathatep in the Library. You learn that Nylonathatep is a god of the Disc who was once summoned by a series of eight murders, forming a perfect octagram that was focused around the centre of the Circle Sea. At long last you seem to be getting somewhere with the murders! 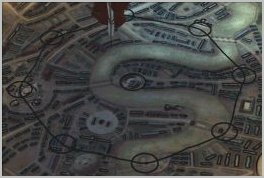 Inside the SANCTUARY you find a map of Ankh Morpork and a fresco on the wall. Examine the fresco and you notice a strange symbol, which you then sketch into your Note-book. Use the map to pin-point each of the six murders you know about (move their icons from your Note-book over the map). You'll see that the murders are forming an octagram, just as was previously done to summon Nylonathatep. By completing the octagram on the map you work out where the remaining two murders will take place. You also discover the location of the centre around which they are focused. New locations at THE DYSK THEATRE, DAGON STREET and THE WIZARD'S PLEASAUNCE are activated. Take the flyer (advertising eight plays) that you find on the seating. Eight plays... an eight-sided octagram... an eight-pointed strange symbol... there must be a connection! Again go to the Library and look for a book on Strange Symbol. You learn that the symbol is known as the Sign of the Eel (or Elver Sign) and was apparently used as protection against certain gods. The book also describes how it should be inscribed. Next look up the eight plays advertised on the flyer. You'll learn that the Eight Great Tragedies were a collection of murders - some of which seem familiar to you. In order to talk to Privatier you must double-click on the 'Stage'. Basically there's not much to gain from talking to him, but if you ask about each murder he compares three of them (Mundy, Malachite and Gamin) to deaths in three of the plays. This is an additional clue to the significance of the Eight Great Tragedies. By now you've probably realized that you won't switch into werewolf mode in the presence of other characters. However, if you stand close to the stage you'll notice that it's high enough for you to be out of Privatier's vision. Change to wolf mode and you see the killer's scent disappears into the stage. After this you'll find some marks (having a definite shape of some kind) on the stage. 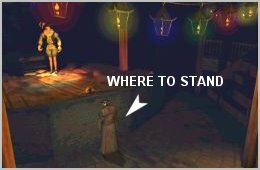 Using the Sign of the Eel entry (you learned how to trace it from the book in the library) on the 'Marks' reveals a passageway under the stage. The passageway leads to a vault. You note that the map of the Circle Sea on the stone altar closely resembles the drawing of the Octagram of Murders. Use either the Octagram of Murders or Eight Great Tragedies entry on the 'Altar' and discover that the locations of the murders in the Eight Great Tragedies correspond with those of the Counterweight Killings. Note that if you haven't researched the flyer in the library this won't be triggered. Read the sign above the boarded up shop to find out that it was a Fish Bar. Use your trusty crowbar to remove the boards and enter through the window. Search the debris and you find a bone. When you examine the bone you realize that you've discovered the seventh murder! You know the last murder will take place here, so all you need to do is hide in the bushes and watch.